I’ve fallen a bit behind in this blogging business, but rest assured, I have been sewing. I’ve got two finished items ready to be photographed and blogged about, and many more projects on the horizon. Blog photos were, in fact, meant to happen today, but it was pouring with rain most of the day, and even though the sun’s out now, my hair is unwashed and I’m in my pajamas. Oh well. 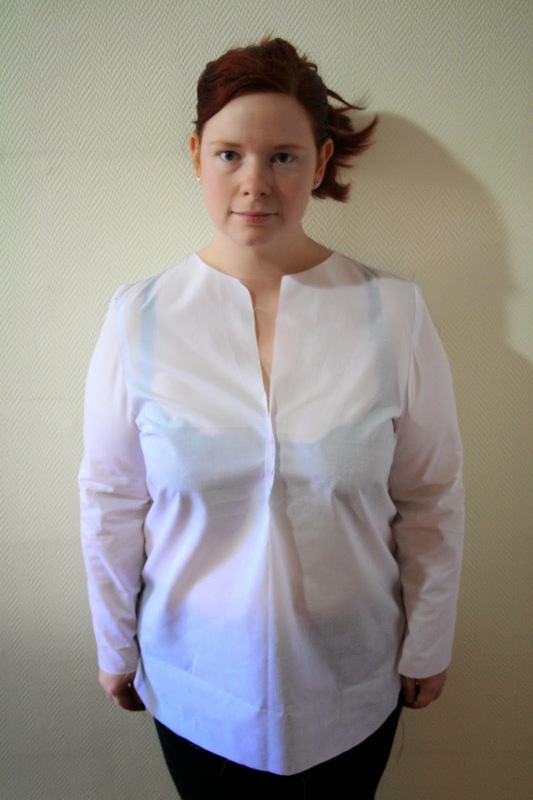 One of the projects I’m working on is the Camilla Blouse by Style Arc fabrics. 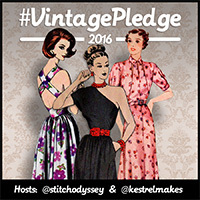 It was originally going to be for The Monthly Stitch Mono-sewn challenge, but buying the pattern and shipping took longer than I thought. Such is life. I just made my first muslin of this today, after making one change beforehand – a 4cm full bicep adjustment. I thought I’d post pictures of it, both to (hopefully) get some advice on further changes that need to be made, and also to show a bit more of the process that goes into a finished garment. I don’t always make a muslin when I’m sewing a new project, and my willingness to bother with it usually depends on how attached I am to the fabric I want to use for the finished garment, and how fitted the garment is. This time, since it’s an indie pattern company I’ve never tried before, and I’m loving the fabric I’ve chosen for the finished blouse, a muslin was a must. Incidentally, I realise these photos are not flattering. My hair needs a wash and white is not my colour. But let’s push on anyway! This is the front view. 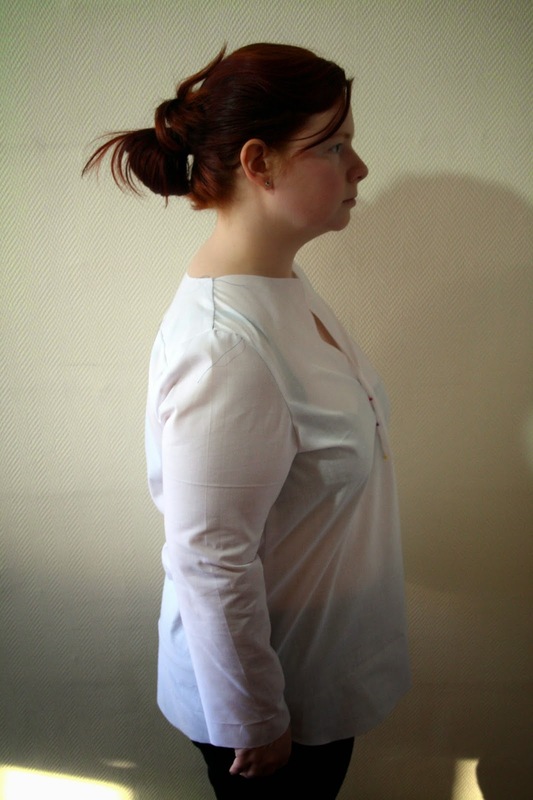 The blouse has a placket on the front with buttons on the lower half, which I didn’t bother with for the muslin – I just pinned it. You can see that with it pinned, it is slightly too tight across the bust, with diagonal lines coming from the shoulders downward. It’s quite roomy through the waist and hips, but the fabric I’ll be using is a soft, drapy voile so I think that won’t be so noticeable then. I’m thinking maybe I need to do a small FBA to fix the tightness in the chest and upper back area, and also a tiny narrow shoulder adjustment. Possibly add 1cm more to the full bicep adjustment? It’s uncomfortable if I stretch my arms out in front of me, especially across the back. Back view. You can see there is a HEAP of fabric pooling around my lower back – I need to sort that out somehow. Some sort of swayback adjustment? You can also see it’s pulling across the lower back down towards the armholes – will this be fixed by an FBA? Or do I need to do something to the back itself? Side view. Despite all the tightness in the upper part of the blouse, you can see there’s also excess fabric sitting around the armhole on the front, and a little towards the back. And all those diagonal lines under the bust towards the side, too. Ugh. So, can anyone help? I can’t go down or up a size without buying a whole new pattern (don’t even get me started on the whole one size thing Style Arc have going on), so I’m only able to alter the size I have. I appreciate any and all advice! Hmmm, I am totally not well versed in fitting. Definitely looks like a swayback adjustment but also maybe slashing and shortening it as well for a short bodice. FBA looks like it will help bit I wonder if it will still have the excess looking fabric below the bust? No idea about the sleeves, that's a tricky one. I bought the Threads Guide to fitting, magazine paired down version for 8$ and it has come in handy more than once. Thanks, Catja! I might just pin out the excess fabric below the bust and see how it goes. It has to be able to fit over my head, so I can't go too nuts with slimming it down though! I think the sleeves will be okay if I just add a bit more onto the full bicep adjustment, shorten them a tad and slim down the wrist area. And Google for how to do a swayback adjustment! I would be careful what adjustments you start with. Maybe work from the too down? The shoulder seam, is it supposed to be that far back? It seems off center to me. The fabrics folds under the back arm/arm pit area seem challenging too. Sorry maybe I am not not helpful at all! Hmm, you're right, I didn't even notice the shoulder seam! It should be a bit further forward. One of those things you only notice in photos! I guess that might be a forward shoulder adjustment? I'll take it slow with the adjustments, it's clearly going to need more than one further muslin, so I might as well take my time. Thanks for the input! I have no idea…sewing is SO darn hard, it does my head in. I hope you work this out..may the force be with you. Thanks, Melanie 🙂 It can be quite complicated, for sure, but satisfying when (if!) you manage to sort it out! I can't see the side seams, but I think they would help us know what's going on in the back. I would definitely recommend starting from the top, with forward shoulder, narrowing the shoulder, and FBA. See what happens from there. If you can, do it with slashing and pinning the actual muslin you have so you can keep going without continuing to re-sew muslins. One thing I remember from watching Lynda Maynard fit things in our Moulage class this Spring was that a couple of times what seemed like it needed a swayback adjustment needed more room in the bum area. Sorry to muddy the waters, especially as the front is very roomy, but depending on what your side seams are doing (pulling to the back or not) that may be the first fix to try for the lower back fit. But all the rules say start up top first. I agree with Bird and Bicycle. Take it slow (one or two adjustments at a time), and I'd start with that shoulder seam that's falling back. How tall are you? 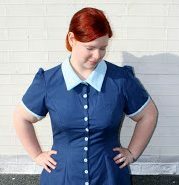 The fabric pooling at the back makes it appear that your back-waist length is shorter than the pattern's, and I think you *might* need to make a small petite adjustment between the bust and shoulders. I do think that an FBA will help, as well. If it were me, for my next muslin, I'd tackle the forward shoulder, pinch out a touch (maybe 1/2″?) between the bust and shoulder, and do an FBA and see what that does. I'd start with the FBA first and then start making your other adjustments, you've made a good starting list. I do think you need to add a bit across the back below the yoke, the diagonal pulls look like it's pointing to that area as being tight. Pay attention to your side seam, it's usually a good indicator of how much to add/take away from the front and back in order for it to be a straight vertical line. Thanks for your help! It doesn't feel like it needs more room in the bum area, but I'll try it on again later today and look at the side seams. I'll see if I can slash and pin the actual muslin, but I've never had much luck with doing that in the past! I'm quite short – only 5'1″ or 154cm, so it's possible the back waist length is too long – the pattern doesn't really seem to *have* a waist, though – the line drawings on Style Arc's website are misleading. The pattern pieces are both kind of A-line, and gently slope out towards the hips. Also, I kind of like the length of the blouse at the moment so I'm a tiny bit reluctant to shorten it. But if you think it might help, I can try! Slope out from the bust to the hips I mean, sorry – it doesn't go in at the waist at all. Thank you for taking the time to comment! I'll try it on again and check out the side seams and see what they're doing, I didn't realise they were so important to assessing the fit. I agree with adding more to the back below the yoke, it's definitely a bit tight there. If you you have a similar blouse in your wardrobe that fits well, place that against your muslin and see how it compares in the shoulders, arms, bust, etc. That may help you figure out what areas you should adjust. I think if you do an FBA and a swayback that will help a lot. It will pivot the shirt to better proportions which may sort out the other problems. Hope it goes well. Thanks Stevie, I'm going to start with the FBA and shoulder adjustments, then move on to the swayback, I think. I've not done a swayback adjustment before, so I've got some Googling to do!